Shanna Compton‘s books include Brink (Bloof, 2013), For Girls & Others (Bloof, 2008), Down Spooky (Winnow, 2005), Gamers (Soft Skull, 2004), and several chapbooks. A book-length speculative poem called The Seam is forthcoming in 2014. Her work has been included in The Best American Poetry series and other anthologies, and recent poems have appeared in Verse Daily, Poetry Daily, Court Green, The Awl, and the Academy of American Poets Poem-A-Day feature. We went Behind the Sestina with Compton to learn more about “The Remarried Again Sestina” which is featured in The Incredible Sestina Anthology. 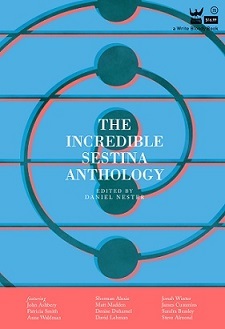 This is something we ask all of our poets: when did you first discover the sestina? I don’t remember exactly when, but I was in college, undergraduate. The first couple of years I lived in New York City. I wrote lots of them for some reason. I remember a terrible one about a manta ray, based on an article I’d read in National Geographic. Later on, I ran across the ones written by the New York School poets—Ashbery, Koch, et al. and was into working with Oulipo constraints too. So I played around with the form some more then, in grad school in 2000-2002. This one is from 2003 and I think it’s the only one I ever published, but I might be wrong about that. Most of the time the drafted sestina would turn into something less formal, if I kept it. I also edited a collection of collaborative sestinas by David Lehman and James Cummins for Soft Skull Press, but I think that was a little later on, in 2006. Compton’s most recent book Brink was published by Bloof in 2013. I remember writing this one specifically for Daniel’s sestina feature at McSweeney’s. I started it at work one day. The repetition of the form tends to work best if the repeated instances of the words migrate through various registers and multiple meanings, so that certainly guided the movement. I don’t recall how I came up with the subject, except thinking I needed six end-words and my mother has had six last names. (One husband she actually married twice, so I used love/lovely instead of repeating that name.) I got married myself the year before I wrote it, so maybe the theme was just on my mind. The beginning of this poem starts out fairly formal, but by the end, the language changes dramatically. Was this a conscious decision? Do you think this poem speaks to the time we are in now, where divorce is common? I hope it’s a satirical look at romantic expectations and the strictures of marriage, particularly for a woman of my mother’s generation. I hope that it’s at least somewhat funny, too, despite the disappointment and bitterness. The pattern toward more relaxed language was suggested by the story of relaxed expectations and also the passage of time, over four decades. She would never talk like that, by the way, but the dirtiest word in the poem is actually how her last name is pronounced, though it’s spelled differently. This entry was posted in Behind the Sestina and tagged Academy of American Poets, Behind the Sestina, David Lehman, Incredible Sestina Anthology, New York School, Poetry, Sestina, Shanna Compton, Soft Skull Press, The Incredible Sestina Anthology, the remarried again sestina. Bookmark the permalink.